I am currently in a flannel phase. But who isn’t, really? Either because of, or as a fortunate coincidence, there has not been a better selection of flannel shirts readily available since the 1990s grunge wave. 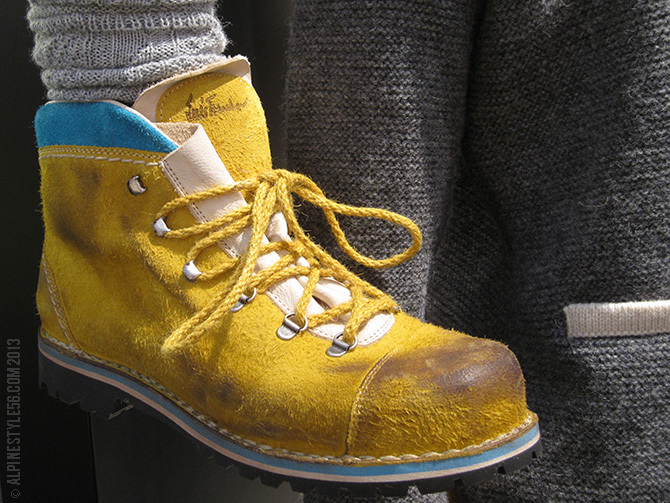 From affordable choices at trend-driven fashion retailers such as Uniqlo and American Eagle to premium offerings from heritage outfitters such as Filson and Penfield, there are many fine options in the mid-range from outdoor sport brands. Bored with tech-y styling and challenged to find lightweight mid-layers, I am on a mission to find options — the flannel shirt could be a solution. 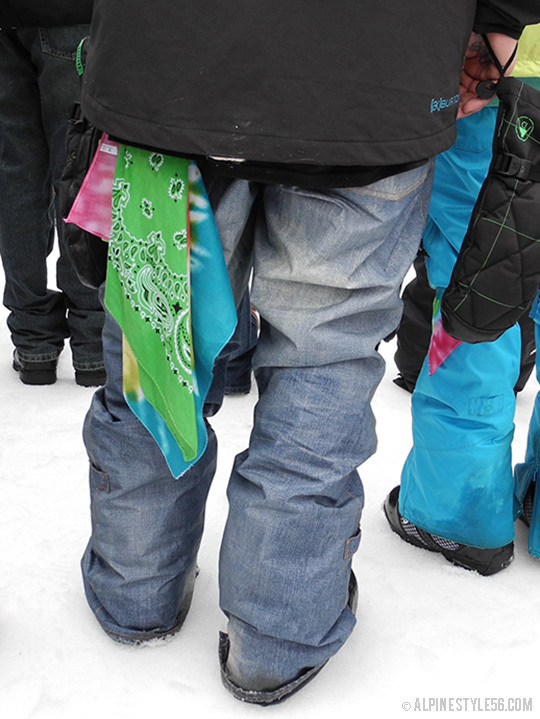 Certainly, this dressing approach is nothing new to much of the snow-sliding population, but for many it falls way outside the realm of acceptable performance layering. For me, I will chance the “no cotton” rule in appropriate conditions! 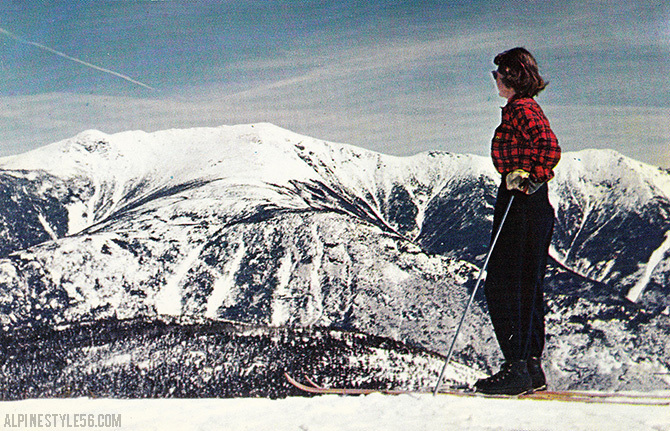 My personal favorite by far is Patagonia’s Fjord Flannel. High quality, not too heavy, not too light, crazy soft, nicely tailored for wearing hem-out and enough sizes available to fit just right. 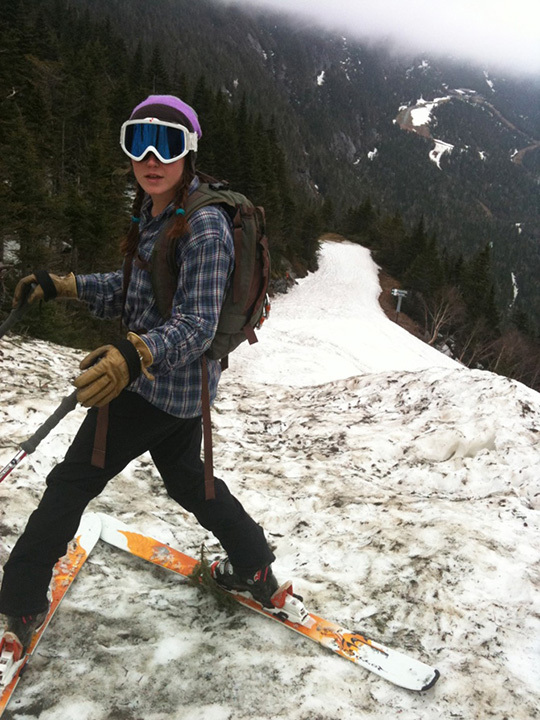 Women’s Fjord Flannel shown here, check Patagonia for the Men’s Fjord Flannel. Stio’s Junction Flannel Shirt for men comes in rich plaids; the women’s Willow Flannel Shirt collection presents a clean, happy look with white running through all colorways. 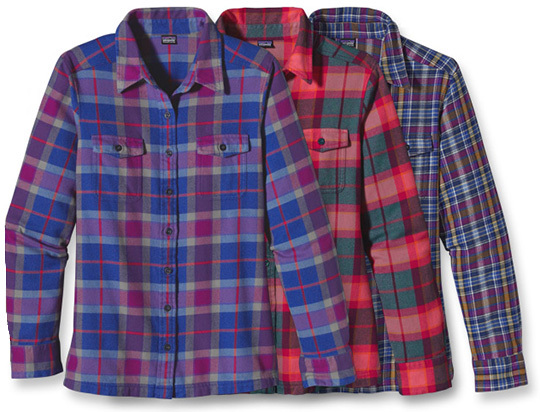 Dakine offers a performance flannel shirt of polyester with a brushed cotton-hand feel – truly more appropriate for snowsport layering than cotton. 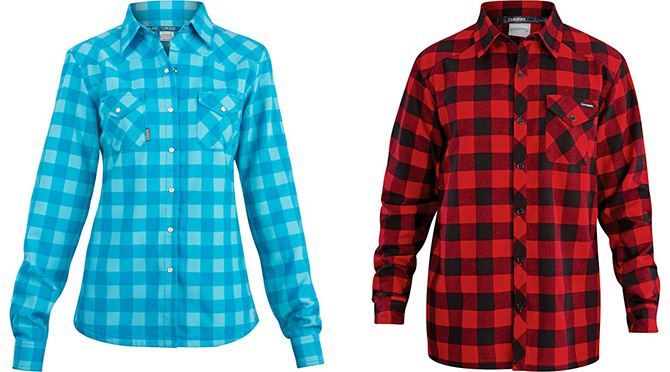 Cypress blue check for women, Oakridge traditional buffalo plaid for men. 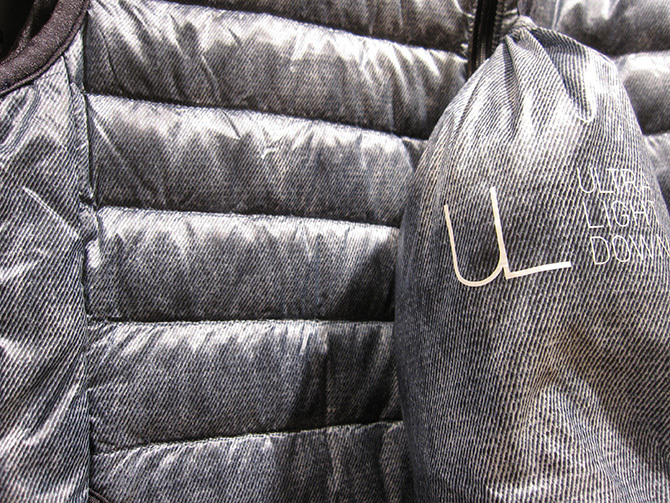 My shopping advice to everyone is this — run, don’t walk to the nearest Uniqlo store (or computer for uniqlo.com) to scoop up some ultra light down. 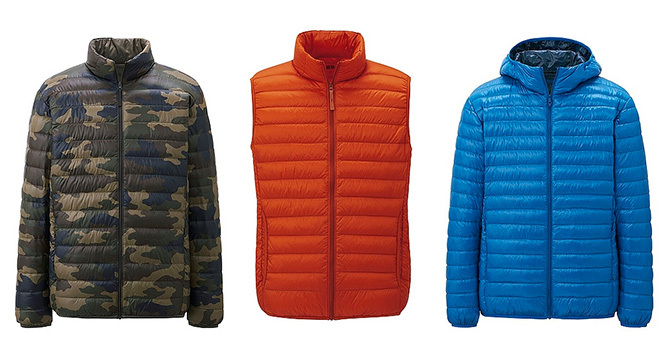 With prices of $49.90 for vests and $69.90 for jackets, it is all too easy to consider an assortment. Last week, after five hours and as many hooded down vests later, I emerged from a Manhattan Uniqlo overwhelmed but hardly defeated by the excessive goodness in store. 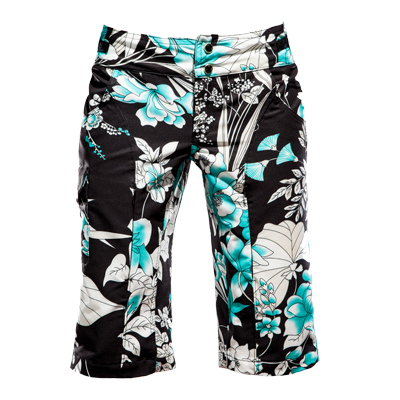 Sure, the down collection is nothing new – but the success has driven more selection in styles, colors and prints! To me, the prints are the real coup: polka dots, gingham, plaid and more for women; camouflage, houndstooth, denim and others for men. 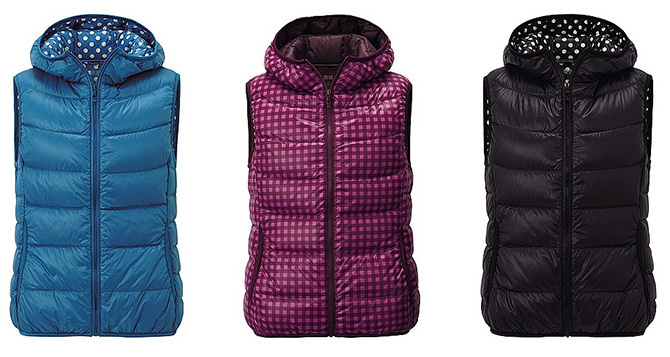 I was defenseless against the super-cute hooded vests with dots and checks! The designs are simple and flattering – the women’s styles in particular benefit from this approach, as they are not overdone with excessive quilting and shaping. In terms of weight, these garments fall in the down “sweater” category, perfect as outerwear in cool (not cold) temps and excellent layering weight. As for quality, the fill is 90% down / 10% feather with downproof nylon shell fabric. Zippers are YKK. The included stuff sack is a reasonable size that makes for easy storage. 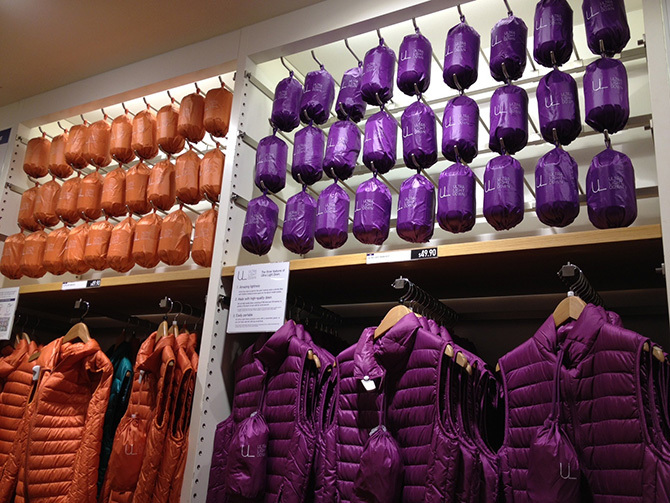 The concept of the compact stuff sack is widely promoted as an integral part of this collection with instructional videos running throughout the store and down garments put into their pouches by sales clerks at checkout. Personally, I have been a big fan of Uniqlo since the Japanese fast fashion retailer opened the SoHo store in 2006. Some of my most worn staples are Uniqlo, product quality is excellent and price can’t be beat. I expect the same of these down pieces and am thrilled to have added to my vest collection for daily uniform wear and broadened my on-hill layering options. 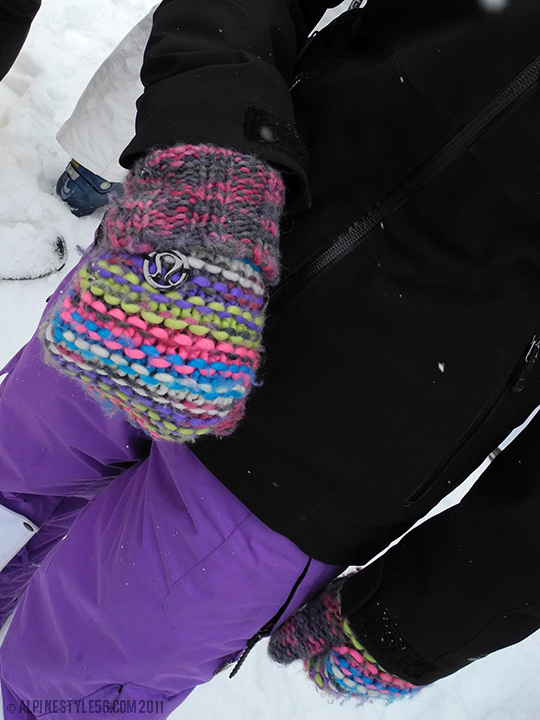 And I can’t wait to layer a polka dotted hooded vest under a contrasting color technical shell! 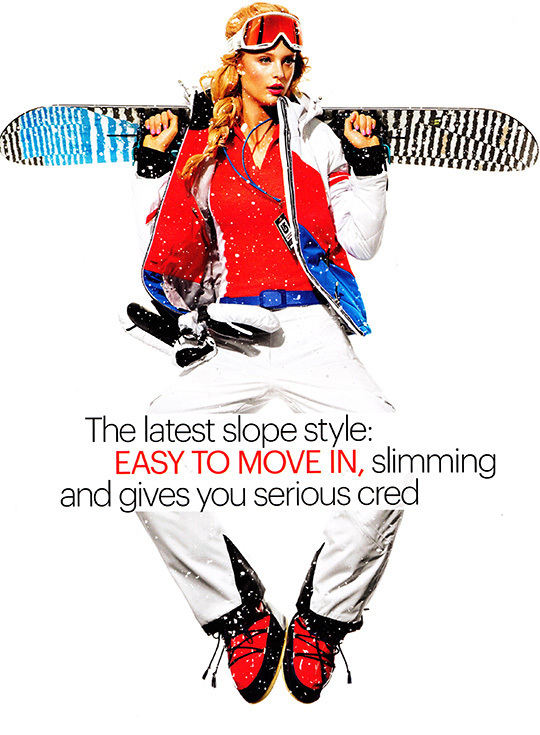 Snow Hot featuring Kate Bock, photos by Arthru Belebeau. SELF, November 2013. 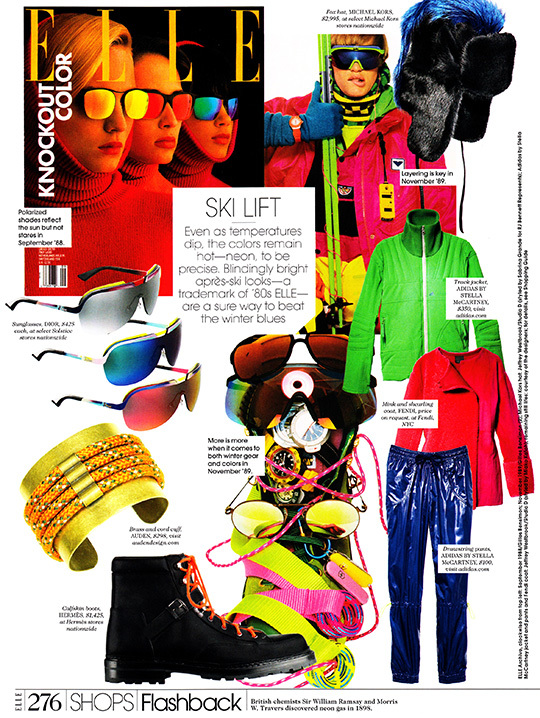 Ski Lift: Even as temperatures dip, the colors remain hot – neon to be precise. ELLE, October 2013. 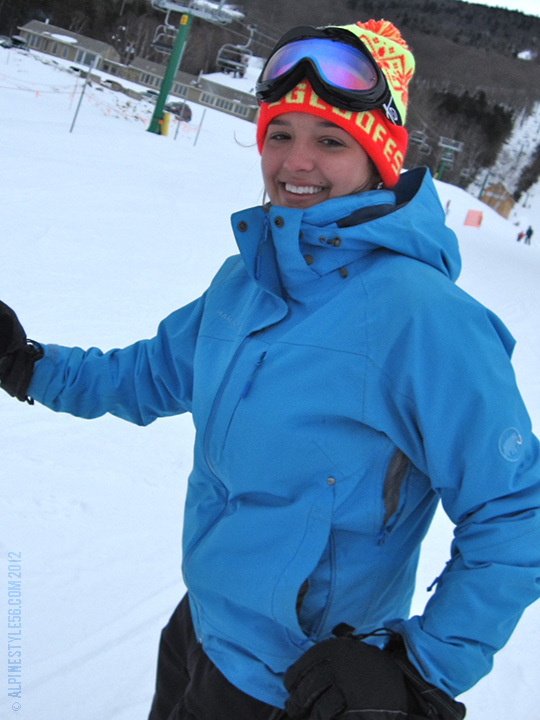 Crystal-encrusted ski goggles. SWAROVSKI ELEMENTS 2013 brand campaign featuring Candice Swanepoel, photo by Nick Knight. The Après Ski Shop. . . Inspired by the Alpine mountains. 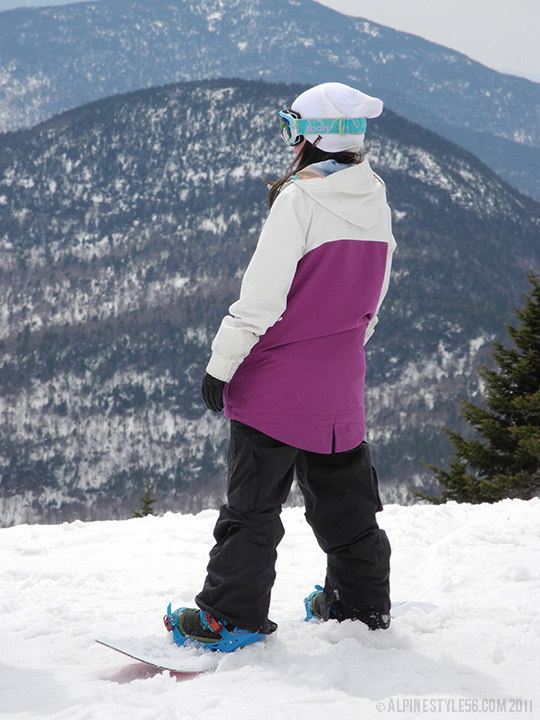 Ready, set, snow. 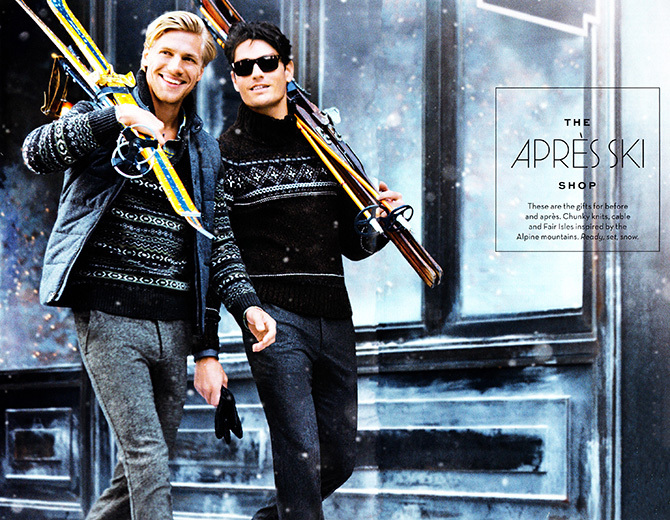 Banana Republic, Holiday 2013. 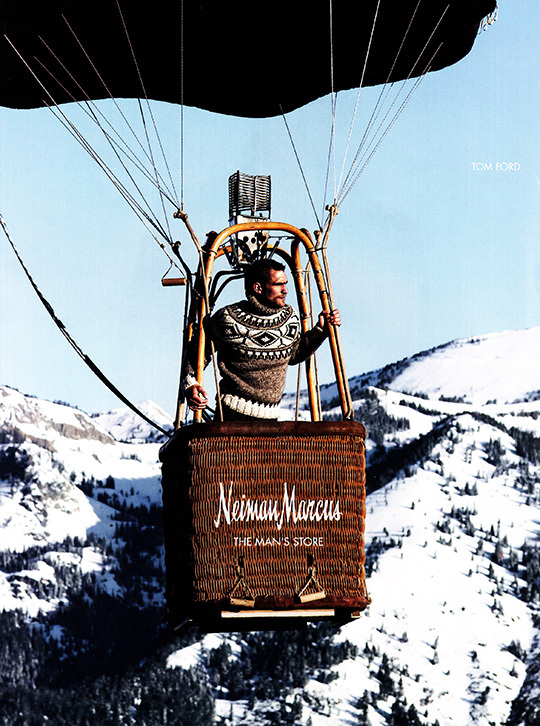 Tom Ford for The Man’s Store, Neiman Marcus, Holiday 2013. Ashley showcasing the full range of the Shredly collection at a recent trunk show. Ashley Rankin is a woman who makes things happen. 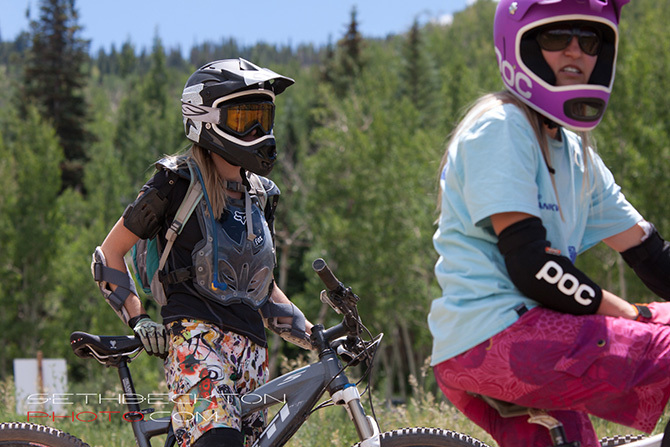 A lifelong Colorado mountain girl and avid mountain biker dissatisfied with women’s performance apparel – she created Shredly to put an end to big, baggy and boring and ushered in flattering, functional and fun bike clothing. As a devout user from the launch of the brand, I can tell you Shredly makes riding even more fun! The short fabric is lightweight and breathable with stretch for mobility while being rugged, durable and surprisingly mud-stain resistant. 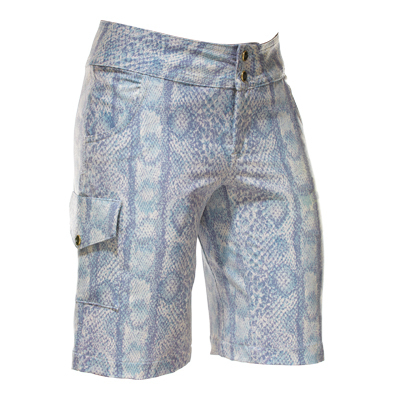 Thoughtful features like adjustable waistband, thigh vents and slim cargo pocket with blinged-out faux-crystal snap put the shorts over the top. 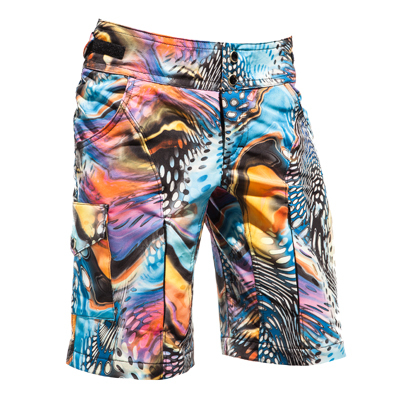 As for the separate inner liner, the Shredly YOGACHAM puts an end to hot and awkward diaper-like chamois. There is just enough padding – but not too much – in all the right places and a low-rise waistband inspired by yoga pants for comfort. The bottom (no pun!) 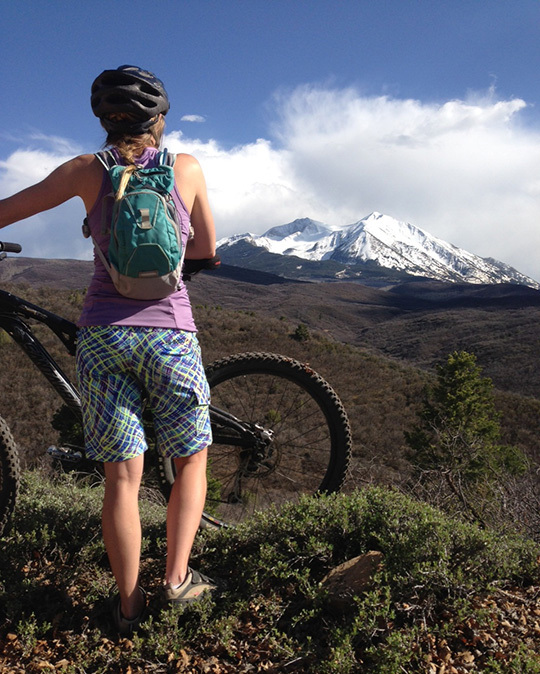 line is that I feel great in my shorts — the fit, function and comfort help me ride longer; style that is fun but also a little badass makes me happy – so I like to believe that Shredly helps me ride a little better! 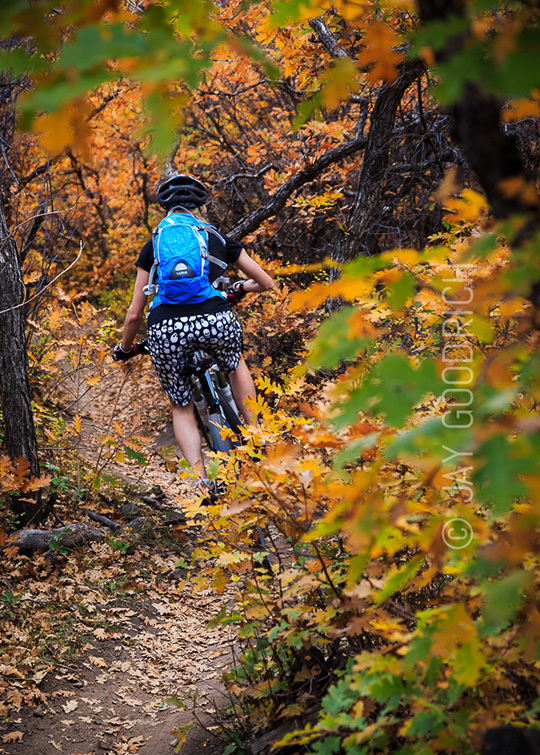 Check shredly.com for the full story and product range, including jerseys. And as Shredly says: Look Good. Feel Good. 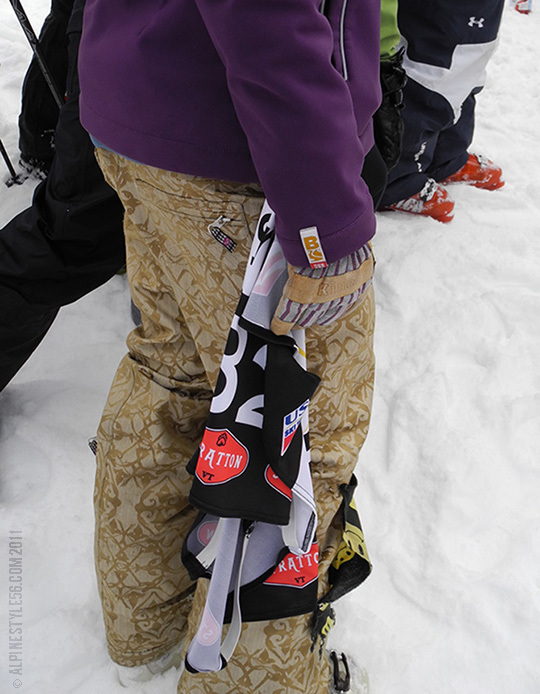 Shred Good. 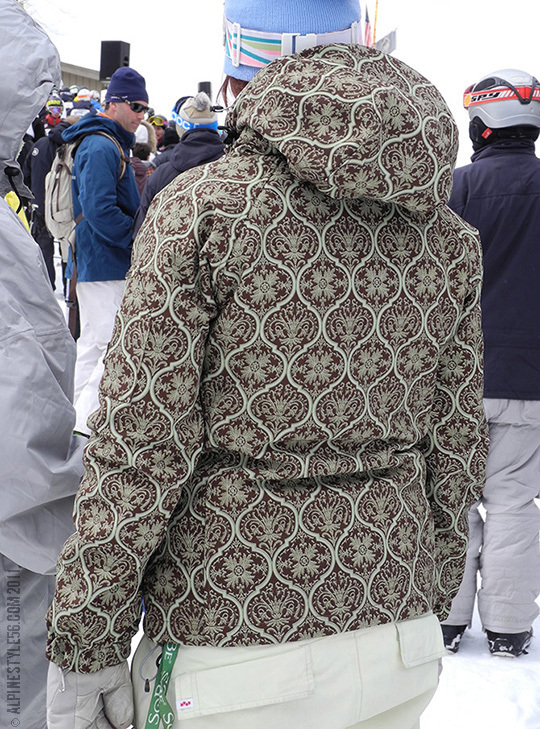 There is a lot of buzz lately about the camouflage “trend”. 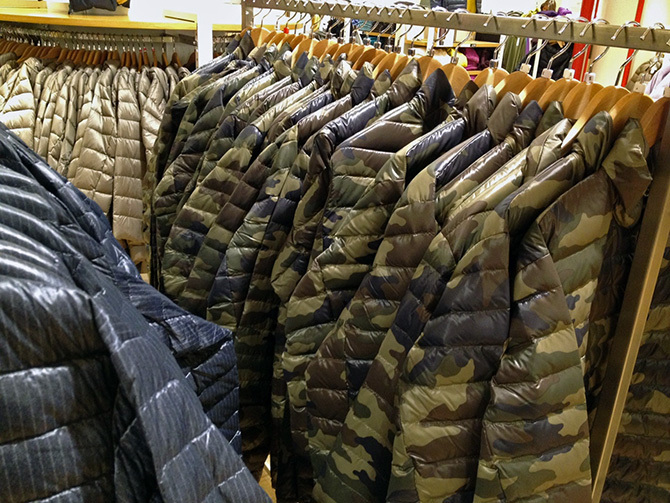 Agreed, camo is everywhere – from Valentino’s Spring 2013 fashion collection to utilitarian L.L. Bean Hunter’s tote bags and nearly any other functional or frivolous product you could desire. I see the pattern more as a standard and accept it as commonplace. 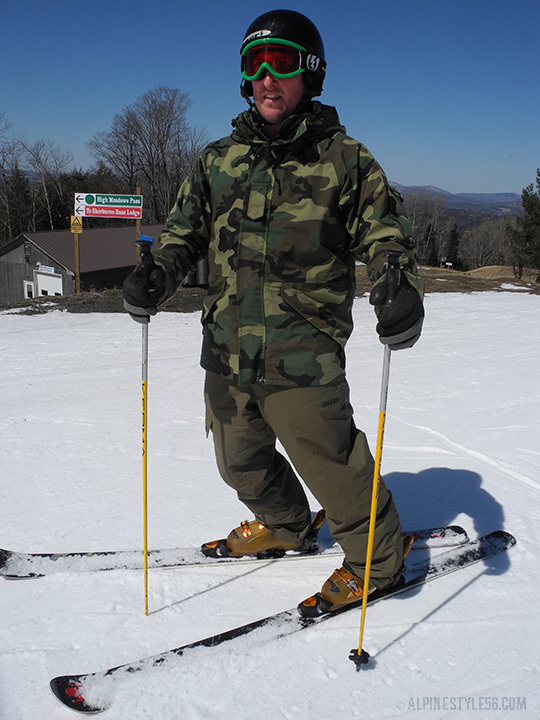 There is no shortage of camo on the slopes manufactured by ski, snowboard and outdoor gear brands. 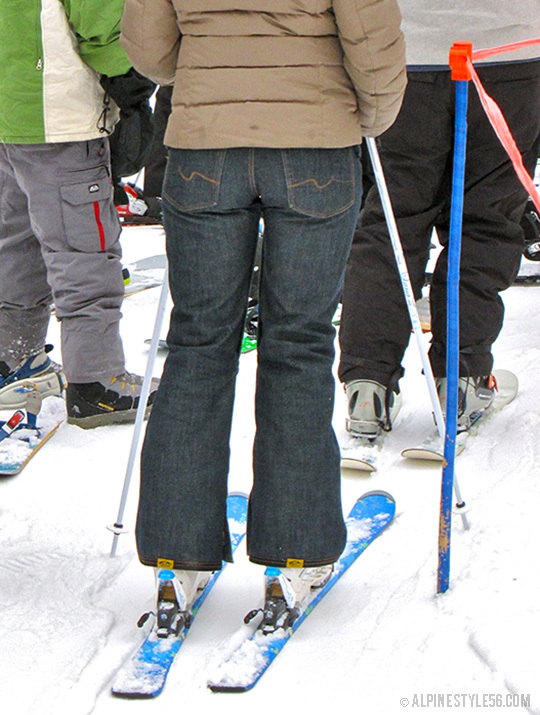 But this guy caught my eye with his army surplus jacket appropriated for skiing and paired with technical pants. The jacket looks right on him – and what he likely lacks in performance of sport-specific outerwear is balanced out in style with authenticity. 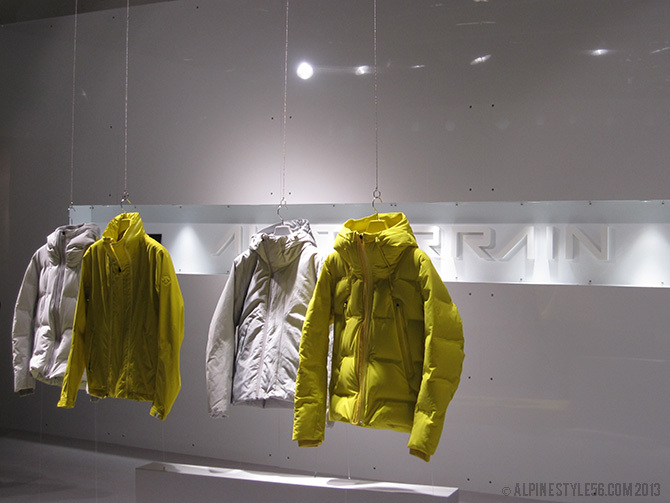 Yellow was everywhere at the February 2013 ISPO Munich tradeshow. 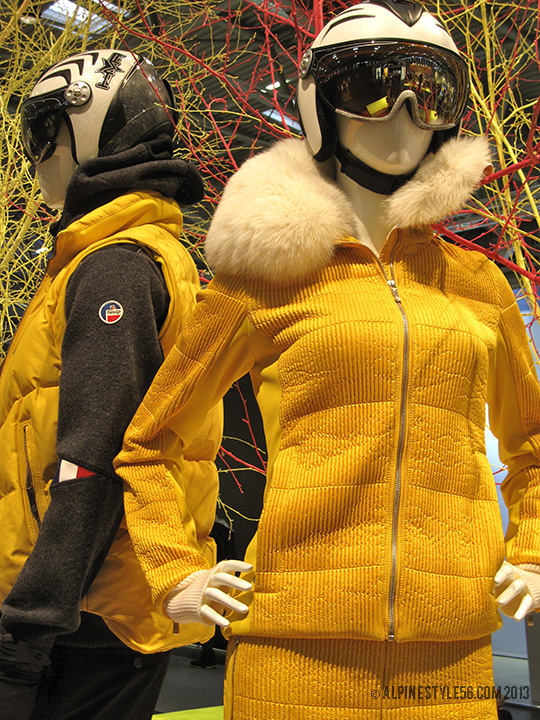 From gold to lemon and everything in between – the sunny hue appears to be the dominant trend color story for winter 2013/14. 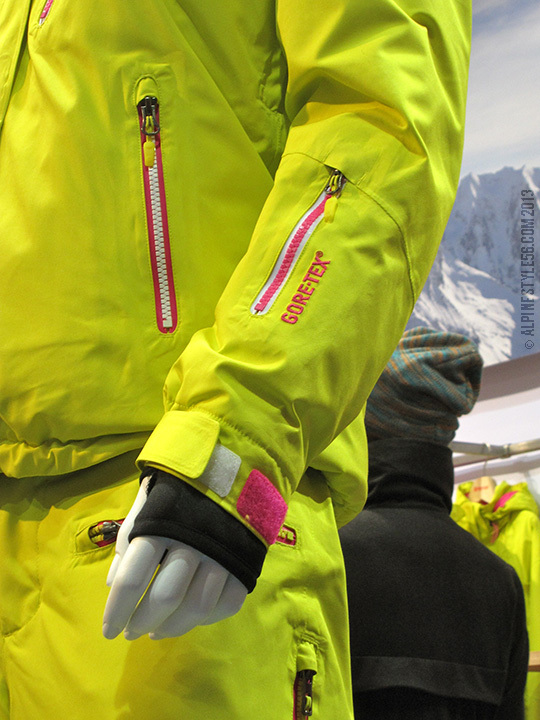 More from the world’s leading wintersport tradeshow to follow soon. . . 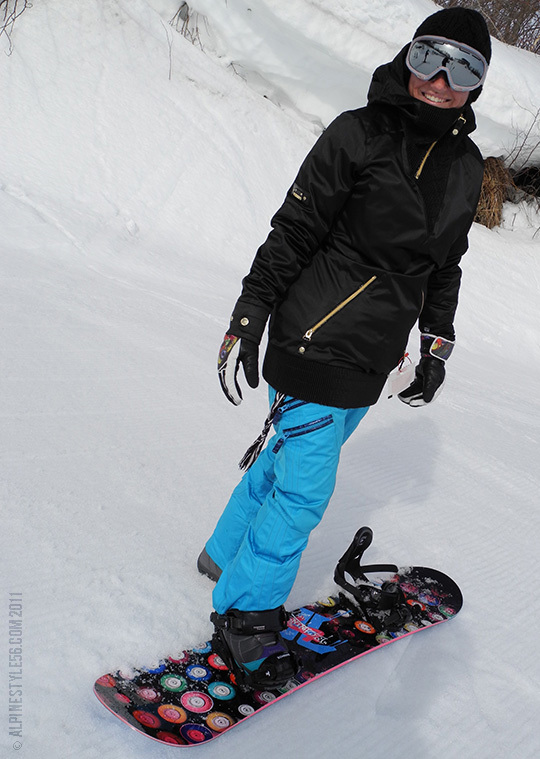 Seeing longer silhouettes in women’s snowboard jackets. Unconfirmed brand @ the US Open. 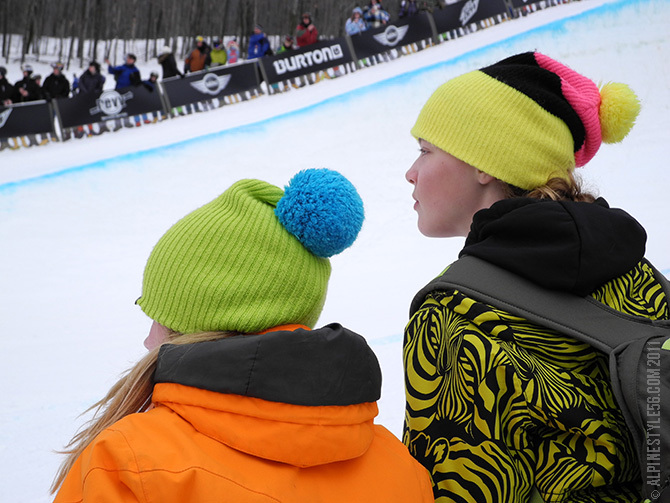 Burton @ the US Open. Spyder @ the Sugar Slalom, Stowe. 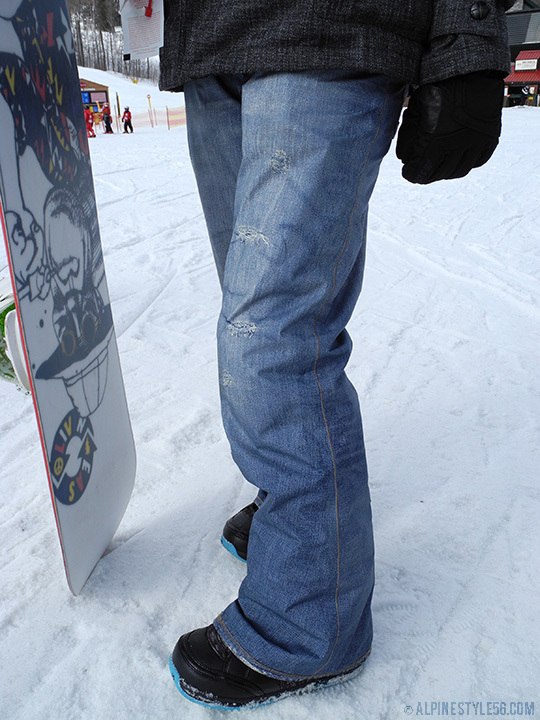 Vans x Seven Jeans @ Jiminy Peak, MA. 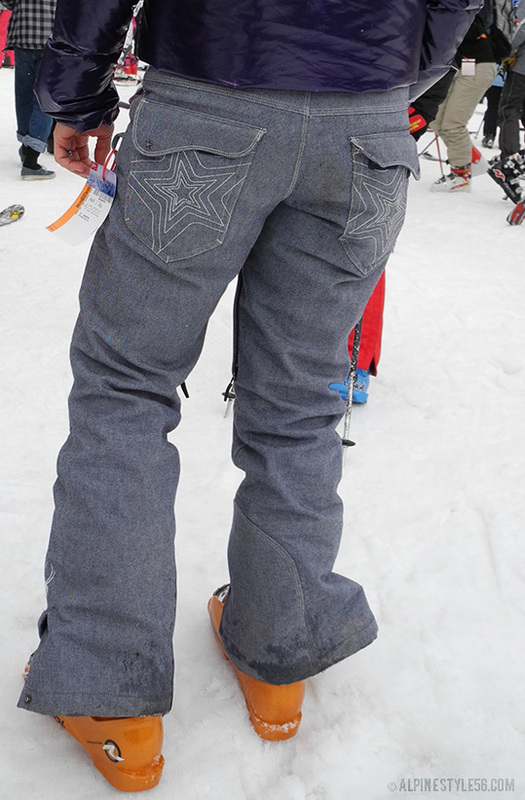 Technical ski/ snowboard pants with denim look. Impressive tromp l’oeil distressing of Burton pants. 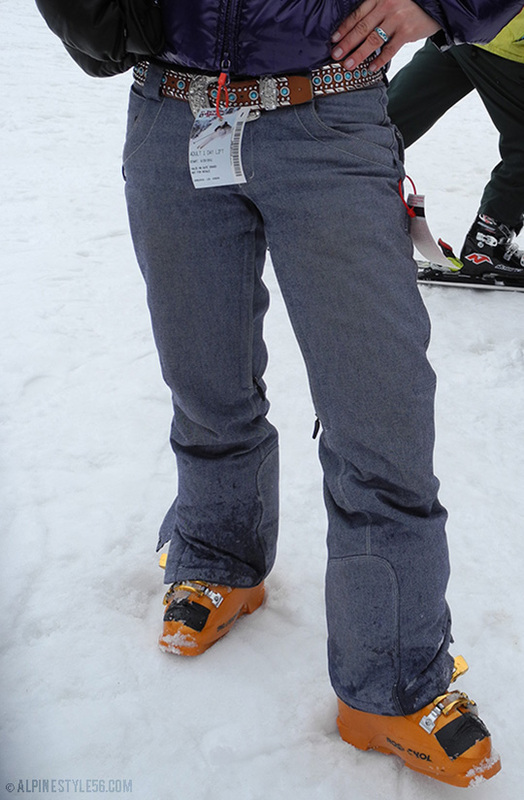 (As well, the best uniform BY FAR at the Vancouver 2010 Winter Olympics.) The Vans collaboration was successful in spot-on replicating Seven jeans fit.